FREE! You'll have lots of love for these Valentine's Day Subtraction task cards! Have fun in math and help your students review or reinforce their subtraction abilities. 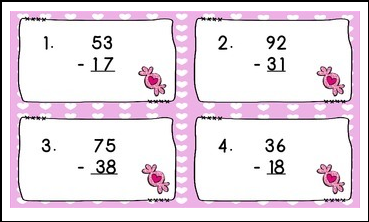 The cards include 2 digit subtraction problems with and without regrouping. These colorful cards are suitable for SCOOT or a math center. * A recording sheet so students can write their responses to each task card. * Answer sheets for subtraction task cards. Please view the preview file prior to purchasing so you know exactly what you are getting. Please make sure that it is appropriate for your grade level prior to purchasing. If you like this product, please leave feedback and follow my store for other fantastic products. Happy Valentine's Day!